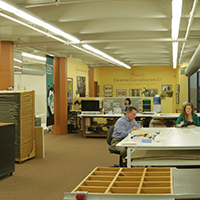 Situated in Chicago’s South Loop, Graphic Conservation Company operates a state-of-the-art, 8,000 square foot lab. Our collection of specialized tools and equipment enables us to treat paper items suffering from many different types of damage. 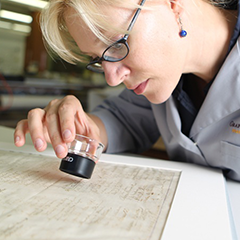 In our lab, we are able to treat works on paper of any size, from miniature ephemera to oversize artwork. 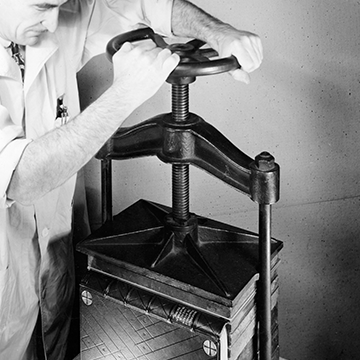 With an extensive library of antique papers and boards, our company also has the unique ability to match repairs when appropriate. 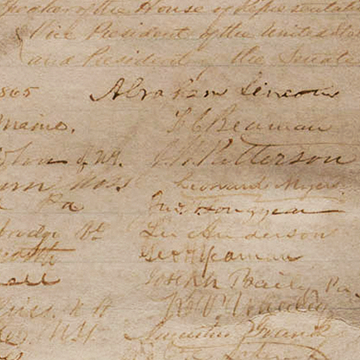 Russ took ownership of Graphic Conservation in 2009. Russ attended Roosevelt University, DePaul University and holds an M.B.A. from the University of Chicago. 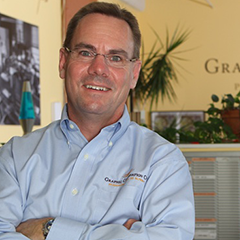 Prior to joining the company, Russ held a variety of leadership roles in the paper industry. 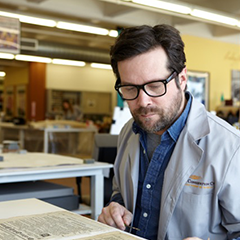 He currently is adjunct professor in the Science & Math Department at Columbia College Chicago, where he teaches the capstone course in the Art & Materials Conservation Program. Christina is a Professional Associate of the American Institute for Conservation [AIC] and an acting member of the Chicago Area Conservation Group. Christina joined the company in 1987 while completing her B.F.A. in Printmaking and Painting from the School of the Art Institute of Chicago. 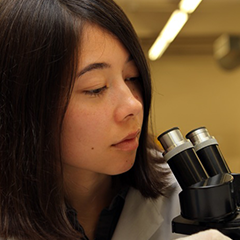 Christina’s background includes fine arts as well as chemistry. Sharon is a Professional Associate of the American Institute of Conservation [AIC] and an acting member of the Chicago Area Conservation Group. Sharon joined Graphic Conservation in 1996 after attending the University of Kansas and DePaul University in Chicago. Brian is a Professional Associate of the American Institute for Conservation [AIC]. Brian joined the company in 2018. Brian has received his B.F.A. in Painting and Drawing from the School of the Art Institute of Chicago and his M.F.A. in Studio Arts from the University of Illinois at Chicago. Brian’s background includes Contemporary Art. 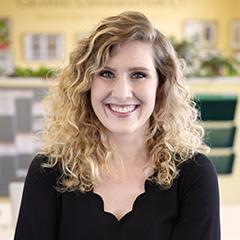 Maggie joined the company in 2012 after completing her B.A. 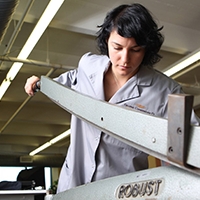 in Art Business, with a focus in Ceramics, from Elmhurst College. Leslie Walthers joined the company in 2013. She holds a B.A. in Art Theory and Practice from Northwestern University. Devyn joined the company in 2018. She received her B.A. in Art Conservation from Columbia College Chicago. 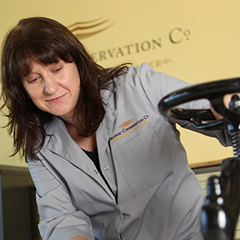 She also holds a Certificate in Conservation and Restoration from Lorenzo de Medici Institute in Florence, Italy. RR Donnelley & Sons Company and president T.E. 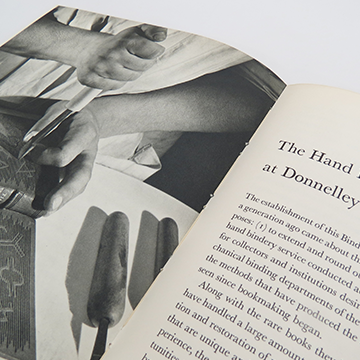 Donnelley form the Extra Bindery Department under the guidance of C.G. Littell and Reverend James Todd. 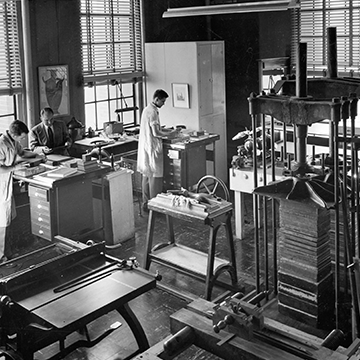 The Extra Bindery Department begins advertising its services in "The Lakeside News," the company magazine. 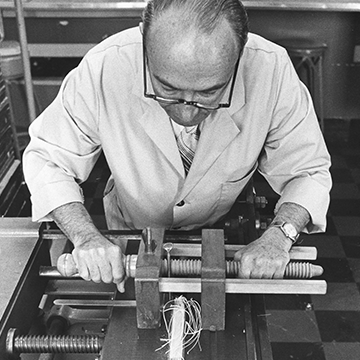 Well-known bookbinder Alfred de Sauty comes from England to manage the Department. "Extra Binding at the Lakeside Press" is published, illustrating the department's services and capabilities. 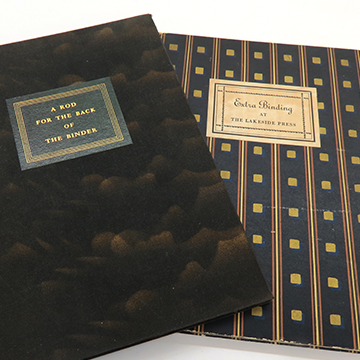 Three years later, "A Rod for the Back of the Binder," an important document in the field of specialty binding, is published. Mr. de Sauty retires, and Harold Tribolet is appointed manager. As he leaves, Mr. de Sauty emphasizes the importance of engaging in paper restoration and conservation work. 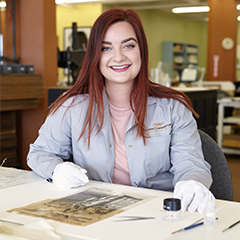 "All the King's Horses" is published, describing many of the department's interesting projects and offering guidance on the proper care of books and works on paper. A 32-page booklet, "The Million Charms of Empress Shotoku" is published, describing many of the department's recent bindings and restoration projects. 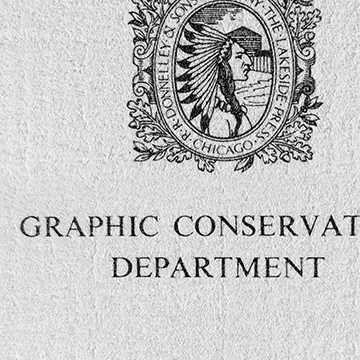 The Extra Bindery Department changes its name to the Graphic Conservation Department, reflecting the increased focus on conservation work. 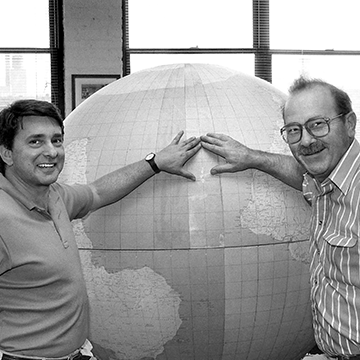 RR Donnelley closes the department and its managers William Crusius and Robert Weinberg form a new company dedicated to paper conservation. 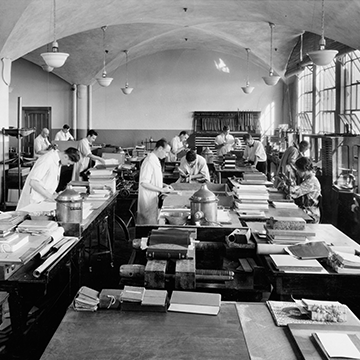 The Graphic Conservation Department thereby becomes Graphic Conservation Company. 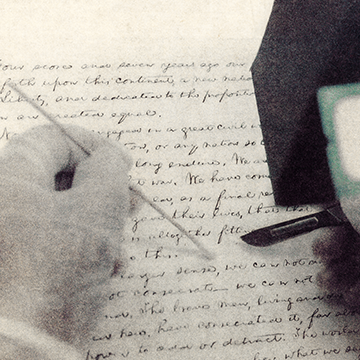 Graphic Conservation Company performs a series of conservation treatments to one of five copies of the Gettysburg Address. 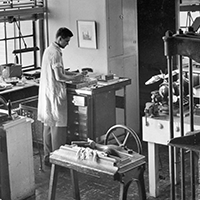 Graphic Conservation Company celebrates its 90th anniversary. 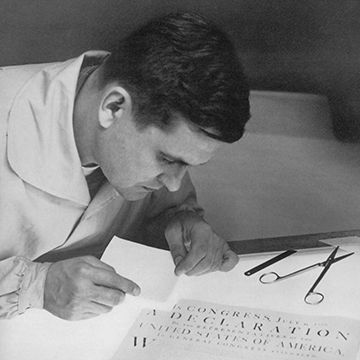 During this year, the company performs a series of complex conservation treatments on the House Resolution for a Thirteenth Amendment to the Constitution of the United States.